Kodak's Professional Portra 160 is a daylight-balanced color negative film offering a smooth and natural color palette that is balanced with medium saturation and low contrast for accurate skin tones and consistent results. Utilizing the cinematic VISION Film technology, this film also exhibits a very fine grain structure with high sharpness and fine edge detail. A micro-structure optimized T-GRAIN emulsion makes it especially well-suited for scanning applications, and advanced development accelerators offer extended versatility when enlarging. This film has a nominal sensitivity of ISO 160/23° and is particularly well-suited to portrait, wedding, and commercial photography, as well as other general applications. 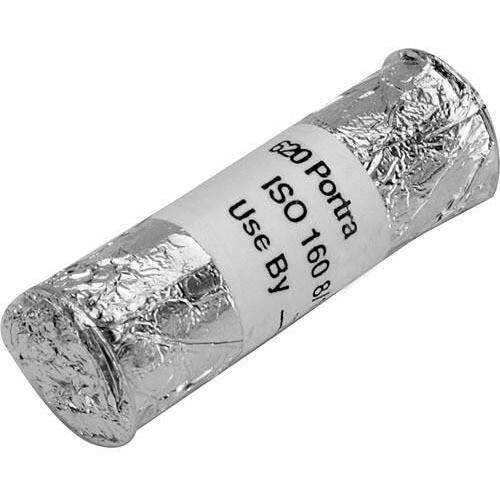 This item is one roll of 620-format film, which has been cut and spooled by Film for Classics. Box Dimensions (LxWxH) 2.5 x 0.8 x 0.8"
Professional Portra 160 Color Negative Film (620 Roll Film) is rated 4.9 out of 5 by 14. Rated 5 out of 5 by Sammy101 from Glad I found the film! I'm glad I found 620 film! I have been surging far and wide. I know you can respool 120 onto 620 spools but honestly if the film is out there use it. I have a brownie hawkeye and have been dying to use it. I was told B and H carries almost everything and they do! The film was delivered successfully and not damaged. I loved the shipping options. Deadlines are important on photography. Overall it is a good product ( its Kodak) and B and H allowed me to shoot old school the right way. Thanks! Rated 4 out of 5 by MIke R from If You Want the Film Look... I really enjoy Portra when I want to obtain the look of color film. To me, the colors are just slightly faded. Skin tones are better of course, the overall color is just a under saturated. A little less punch than Ektar 100, and certainly quite a bit less than a Fuji Velvia for example. Having the 120 Portra re-wound onto 620 spools is a nice service to offer, albeit more expensive. Makes my two Kodak Medalist cameras operable, thanks! Rated 5 out of 5 by Melodie from Great find! So glad I was able to find this film! It's great, just what I was searching for and arrived quickly! For use in my old Sabre 620. Rated 5 out of 5 by Jason from Works in the Medalist This film is compatible with the Kodak Medalist series, but the plastic spool makes it tough to take out. It's nearly grainless, but lower contrast in the Medalist than I would like. I would venture that some of that ties to the camera (where the lenses are not coated for high contrast), but the smoothness of the pictures compared to 35mm, makes it enjoyable in sunny scenes. Physically this is the same as 120 film, but on a 620 spool. If your lab can do 120, they can do 620... just ask for the spool back. Rated 5 out of 5 by Patunia from Easy solution for vintage cameras I have a collection of old cameras that use old film sizes. It is very encouraging to have access to many of those sizes at B and H. Portra is a great color film with accurate color representation across subjects. I am very pleased with the results! Rated 5 out of 5 by Anonymous from This is great! I was so happy to see B&H carried the 160 film! I might try to roll 120 film (same thing as 160 film but comes on a 120 size spool) to the 620 film spool myself (it's cheaper) in the future but for now I'll be buying the ready to load 160 film. Rated 5 out of 5 by Chris the Tubist from Worked Flawlessly I recently purchased an old Kodak camera at a flea market. I assumed it would take 120 film, but to my surprise, when I opened it up, I saw a large label that stated KODAK 620 FILM ONLY. DO NOT USE 120. While I do know that it's possible to use 120 film in it, it was still missing the spool that I needed. I didn't have to search the web long before I found B&H and realised that they sell 620 film. I was very pleased by the quality, pricing, and even delivery time of my product. Would this be the correct film for Kodak Brownie Holiday Flash and a Kodak Brownie Starflash? Just got a couple at an estate sale and my research says they need 127 film but other things I've read are saying this type of film. Both those cameras take 127 film. As for color film in these f/8 lenses, I'd recommend B&amp;W film for Brownies for most uses, unless you want cross-processing effects. Does anyone know who can develop this film once you have taken pictures with it? How many frames are on this 620 film? Unlike 35mm, 120/620 film rolls are a uniform length, but not all cameras photograph in the same aspect ratio, so the camera type determines the frame count. Standard cameras fit between 8 and 16 frames on a roll, with 12 being the most common.